Whether you share your own ideas or great idea from others, posting content online is one way build your brand. It’s a long-term strategy for online visibility! You don’t have to spend every waking moment glued to social media. You just need to put some thought into it and then invest either 15 minutes a day or about an hour per week. That’s all it takes. Remember, investing in your career is a smart way to meet new people and get found online. Identify who the potential customer/client is. Next, identify the interests and problems these potential customer’s face. Finally, share articles, videos, research, infographics and credible news that addresses the interests/problems of their target audience. What problems do hiring managers have? Time management, resource management, technology, keeping up with industry news and trends. Follow these folks on LinkedIn. See what they are sharing. What influencers do they follow? What groups do they belong to? What publications do they read or share from? Next, see if you can find them on other platforms (Twitter and Instagram are good places to start). Yes, this is stalking. But it is also market research. You can learn a lot about what is important to them and what they find news-worthy by doing this investigation. Now, begin sharing content you know is going to solve a problem for them. In other words, share content you know they would be interested in. These are some of the types of personal status updates you can use on any social media platform (LinkedIn, Facebook, Twitter, or Instagram). FYI: Visual content makes for fast, easy and sharable nuggets. Also, be sure to give credit to the author/source by tagging them when you re-share their work or updates. In order for you to re-post relevant articles and information with your network, you need to have sources- blogs, online magazines and sources of industry news. Subscribe to industry newsletters, industry expert websites, and stay on top of what’s going on. You can also use AllTop or SmartBrief to identify popular industry articles. The challenge for me was not overloading my email with hundreds of newsletters from all these sources. I use Feedly to get articles from great resources/publishers. Instead of ending up in my email box, I just open Feedly and I can see all the newsletters, articles and updates I ask for. I use categories to organize the news sources and when I find a good source, I add it to the appropriate bucket. By the way, these categories are very similar to the lists I created and use on Twitter. It makes it easy to find what I am looking for and what I share if I categorize by industry or expertise. Your categories may be industry name, type of companies you follow, influencers/important people in your field, career/job search info, interests (sports, hobbies, etc.). Remember, you want to keep coming back and using this, so you might as well have an incentive to draw you back. When you find an article, but don’t have time to read it, save it to read later within the platform (LinkedIn and Facebook both offer this) or use Pocket and you can go back. 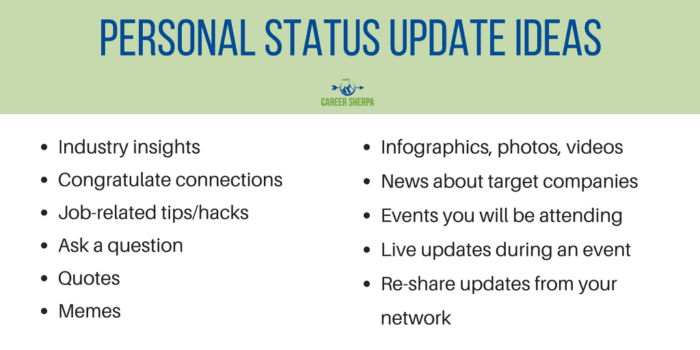 Here are ideas for other types of status updates! Though these updates are for LinkedIn, they also will work for any other social network! Once you find good sources, you will never have a shortage of information to share. The problem is, once you’ve shared your great finds, they get lost. Have you ever tried to search for something you shared on LinkedIn? It isn’t easy. Having a go-to resource to see everything you’ve shared is helpful for you, but more importantly, it’s great for your personal online reputation! These are some of the tools available to you today to showcase what you’ve read and shared. These tools are like your own online magazine. Since Pinterest is an online visual scrapbook, think about how it could be a destination for your potential customer/client/hiring manager. Create boards and add articles about industry news, technology tips, leadership links and your own important career highlights or skills. Also, consider your Pinterest page as a portfolio. Create a board to highlight your work and achievements! Always keep in mind keywords and terms recruiters (or others) would use to find someone like you. Use solid, descriptive words and hashtags to label your pins and boards. Make it easy for someone looking at your board to find what they are looking for. You may even try to make it a fun experience with clever board titles. 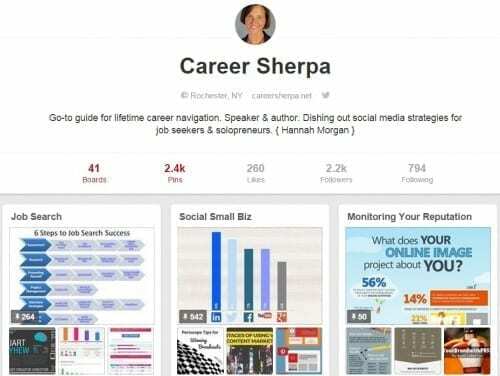 Here are some examples of how people are using Pinterest for personal branding. > What Pinterest Says About You. Flipboard is another online magazine-type tool. Scoop.it is another tool you can use to collect articles and share a link to your Scoop.it page every once in a while. You can also find other people who are using Scoop.it and follow their scoops! You want people inside and outside of your network to recognize you and associate you with an industry/occupation. Sharing on-brand articles and information helps do just that! Share it on Twitter, Instagram, Facebook and where ever you are social. An easy way to do this is by creating a visual (using Canva) and include a link as I did here. Share a link as a personal Facebook status update. You’d be amazed by how many of your friends want this type of work info. And make sure you add your update for this as a PUBLIC status update. Use keywords/terms (and perhaps even a hashtag) to attract the right audience. Not everyone will want to see your information but that’s ok. Be clear about who will benefit from reading what you’re sharing (and attract the right people to your articles). Share a status update regularly (once a day) on LinkedIn. Share a link to your summary or collection on LinkedIn once a week. You can share other articles or ask a question on LinkedIn for the other days of the week. Write a long-post (blog) on LinkedIn and share the link. Read about how to create a blog post on LinkedIn here. 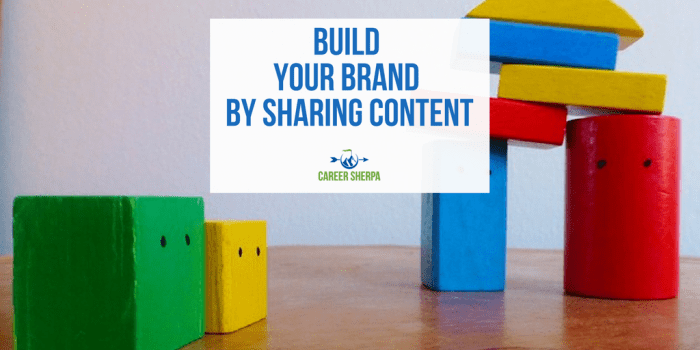 Sharing content related to your industry or occupation on a regular basis will help you establish and cement your online personal brand and help you create a reputation as someone who is knowledgeable.